Hudson Square North proposed rezoning. Image: Courtesy of NYC Department of City Planning. Residents and elected officials warn against disturbing area’s critical balance of uses. 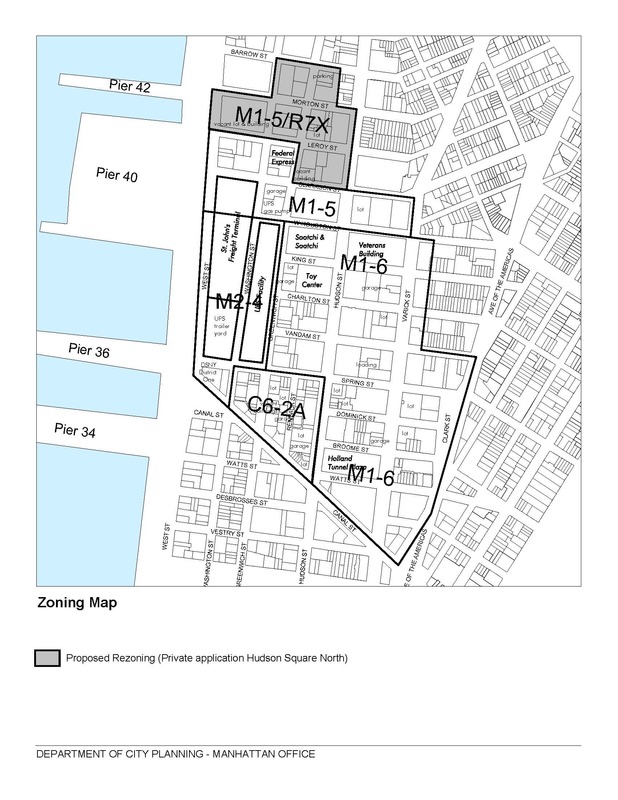 On April 23, 2008, the City Planning Commission heard public testimony on KMG Greenwich’s proposal to rezone five and one-half blocks of Hudson Square North, roughly bounded by Morton, Hudson, Clarkson, and West Streets. Currently, the area’s zoning prohibits as-of-right residential development. Under KMG’s proposal, the area would be rezoned to M1-5/R7X, allowing residential, community facility, commercial, and manufacturing uses. The proposal would facilitate the residential conversion of 627 Greenwich Street, as well as the development of a new 80,000-square-foot residential tower at 111 Leroy Street. 5 CityLand 7 (Feb. 15, 2008). At the public hearing, attorney Jay Segal of Greenberg Traurig, representing KMG, argued that Hudson Square North, after a series of BSA variances, was already a predominantly residential neighborhood. KMG’s environmental consultants, AKRF claimed that the proposal would result in the relocation of only 90 jobs. Representing local business La Frieda Meats, attorney Eric Palatnik testified that active manufacturing operations in the area were already infeasible because of the influx of young families, and that rejecting the proposal would not change this reality. Attorney Stuart Beckerman, representing Kopper Chocolate Company, claimed that the proposal would benefit local businesses, even if they choose to relocate, because it would increase property values. Elected officials testified against the proposal. Representatives for State Assembly member Deborah Glick and State Senator Thomas K. Duane called the proposal a “piece-meal” rezoning that would open the door to a rush of residential development and undermine the commercial tax base. Jennifer Barrett, of the New York Industrial Retention Network, argued that the proposal would cause the area to lose nearly 2,000 existing and future jobs, along with 250,000 sq.ft. of sorely needed commercial and manufacturing space. Richard Abel, of Abel Cine Tech, one of several media businesses in Hudson Square, testified that the proposal threatens the area’s growing post-production community. Finally, Zach Weinstein of Greenwich Village Community Task Force claimed that Hudson Square could not accommodate more residents, as its public schools and sewer system are already overburdened. The Commission must vote on the matter by June 5, 2008. CPC: Hearing on Hudson Square North Rezoning (C 070 575 ZMM – map amend.) (Apr. 23, 2008) (Jay Segal, for KMG Greenwich).